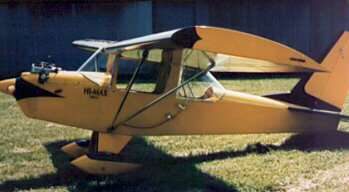 A wrap-around windshield of Lexan makes for excellent visibility and comfortable flying. Optional windows are removable for open-air flying in the summer. Wood was chosen as the basic building material. It is easy to work with, dependable in its strength characteristics, and is not bothered by the vibrations associated with 2-cycle engines. Construction techniques are of the old-fashioned, tried and true wood truss and plywood gusset method. It is very simple, and builds quickly. service ceiling < 100 ft.